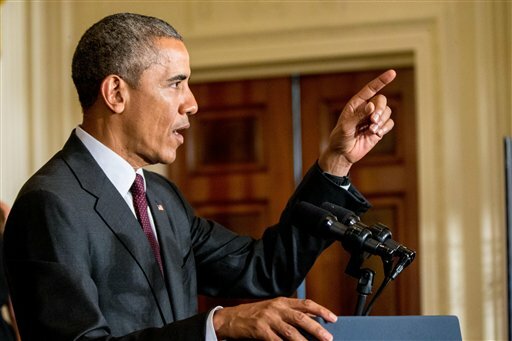 President Barack Obama is depicting a looming congressional vote on the Iran nuclear deal as the nation’s most consequential foreign policy debate since the authorization of the Iraq war, a now unpopular decision that still reverberates through American politics. In a bid to discredit criticism of the deal, Obama will also argue in a speech Wednesday at American University that the politicians who supported the Iraq war now oppose the diplomatic deal with Iran. While Obama was an early opponent of the Iraq war, several of his top foreign policy advisers voted for the 2002 authorization, including Vice President Joe Biden, Secretary of State John Kerry, and former Secretary of State Hillary Clinton, the front-runner for the Democratic presidential nomination. They now say the war was a mistake. The backdrop for Obama’s speech is meant to link the nuclear accord to a long tradition of American diplomacy, often conducted with unfriendly nations. He’ll speak at the same university where President John F. Kennedy made a famous call for Cold War diplomacy and nuclear disarmament. His address also coincides with the anniversary of the nuclear test ban treaty, the landmark 1963 agreement Kennedy and leaders from the Soviet Union and Britain finalized shortly after the president’s well-known speech. Obama’s address is part of an intense summer lobbying campaign by both supporters and opponents of the nuclear deal. Congressional lawmakers will vote next month on a resolution either approving or disapproving of the pact. Some key Democratic lawmakers announced their support this week, including Sens. Tim Kaine of Virginia, Barbara Boxer of California and Bill Nelson of Florida. However, the administration lost the backing of three prominent Jewish Democrats — New York Reps. Steve Israel and Nita Lowey and Florida Rep. Ted Deutch. Obama has presented the choice before lawmakers as one of war and peace. During a private meeting Tuesday with American Jewish leaders, Obama said that if Congress blocks the deal, the only option he or the next president would have for stopping Iran from obtaining a nuclear weapon is military action. Critics of the deal, including Israeli Prime Minister Benjamin Netanyahu, say Obama is delegitimizing their concerns and instead painting them as eager for war. In a webcast Tuesday aimed at American Jews, Netanyahu called that argument “utterly false” and said Israel wants peace, not war. To Obama, Kennedy’s willingness to negotiate with the Soviet Union at the height of the Cold War is a useful comparison for defending his engagement with Iran, a country long at odds with the U.S. and its allies, particularly Israel. American University is also where Kennedy’s brother, the late Sen. Edward M. Kennedy, endorsed Obama in the 2008 Democratic presidential primary, a significant passing of the political torch from the youthful late president’s family to a new generation. Even as they link Obama’s diplomacy to Kennedy’s, White House officials argue that the president’s Iran accord has a key advantage over the nuclear test ban treaty. Earnest said that while Kennedy had to roll back components of the U.S. nuclear program to strike a deal, Obama made no concessions to Iran that weaken U.S. national security. Ahead of Obama’s address, Wendy Sherman, chief U.S. negotiator in the lengthy nuclear deliberations, and Adam Szubin, acting undersecretary of the Treasury for terrorism and financial crimes, are to testify before the Senate Banking Committee. In another sign of the administration’s all-out campaign, Sherman, Szubin and Energy Secretary Ernest Moniz also will brief senators Wednesday in a closed-door session. The president, long criticized for his limited outreach to Capitol Hill, has displayed in particular a rare level of personal engagement with congressional lawmakers. Since the Iran agreement was finalized last month, Obama has had individual or small group conversations with 84 lawmakers. Cabinet secretaries and other senior officials have had similar outreach to 180 members.